The St. Joseph’s Monastery, one of the greatest centers of spiritual life of Russian orthodox people, was founded by a prominent church and public activist, theological writer, and orthodox zealot – St. Joseph of Volok Town – is situated 20 kilometers from the ancient town of Volokolamsk. St. Joseph was born in 1439 near Volokolamsk (100 kilometers to north-west from Moscow). As a youth he already felt a desire to become a monk, and after he had learnt to read and write in Volok’s Monastery of the Exaltation of Cross, he came to the Cloister of Nativity of the Mother Of God at Vozmishche place where he stayed till 20 years old. In 1460 St. Joseph professed monastic vows in the Cloister Of St. Pafnuty of Borovsk (to south area from Moscow). He carried out his monastic labours at St. Pafnuty’s Cloister for 18 years. In 1477 the leader of Russian Church Geronty ordained him priest and abbot. 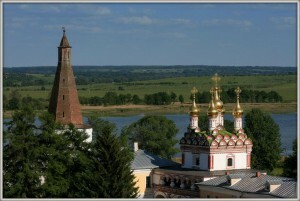 In 1479 St. Joseph founded a monastery on the land of Prince Boris near Volok town. The first wooden church – the Church Of the Dormition of the Holly Virgin – consecrated on August 15, 1479. A strict cenobitic rule was adopted at the monastery. According to this rule monastic disciplines were carried out in conformity with the three stages of monastic life. None of the brethren had any personal belongings and everything was held in common. The library and scriptorium, organized by St. Joseph himself, played a very important role in the life of the monastery. Not only St. Joseph was the author of a number of theological works, he was also a very skilled calligrapher. A collection of his exhortations entitled “The Enlightener” was widely known. In the 16th century there were more then 1 150 manuscripts in the monastery. A profound theological education and gift for polemics made St. Joseph a zealous defender of Orthodoxy from heresy. He was also famous for his charity. Sometimes up to 600-700 pilgrims were fed in the monastery. During St. Joseph’s lifetime the monastery became one of the largest centre of Russian religion culture. The saint spent 36 years putting in order of the monastery. St. Joseph reposed in 1515 and was canonized by the Moscow Church Council of 1591. The celebrations in honor of St. Joseph are commemorated on September 22 and October 31.